Sandeep's Blog !! : Saving cost on Passport photo ! I read about this @ The Stupid Passport Photo Ripoff . I have not personally tried the FREE service http://www.epassportphoto.com/ but I feel its worth a try. We always need passport size photo's of various size for different documents like banks, passport office, membership forms of clubs etc etc .. 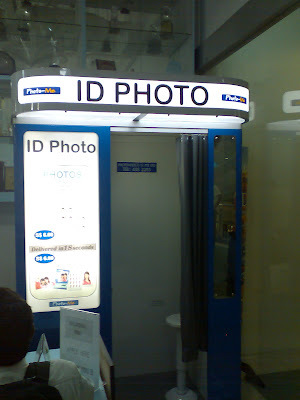 In Singapore there are self-service booths which offers passport size photo's for $6(4 copies). I liked this service very much. You will find the booths in many convenient places where it is most needed. Also it is at most of the MRT stations ! The Photo guy also charges the same amount as these machines but takes 30 mins to deliver!. So only in case when you need more photo copies, its worth going to the shop for clicking the photo. I use http://www.snapfish.com.sg to print photo's in Singapore. Its pretty good service. They charge 19c per photograph. Also you get 20 prints FREE when you first sign up and also when you refer somebody who sign's up their service!. If you are trying print photo's from shops in Singapore, they are expensive as they charge around 40 cents for upto 10-20 photos. i observed the notice at our photo studio guy's which had different passport photo size requirements for about 9 countries listed. god knows how the 5mm differences are going to help national security, but they sure help our photo guy charge as much for 10 passport copies as for a complete roll of normal film! by the way, thanks for commenting on my Nano post.